It is difficult to celebrate a festival of thanksgiving when giving thanks is an act that must be summoned from the remnants of our broken lives. The complication is a paradox. We ‘give thanks’, but are not grateful. We give thanks, but feel ungrateful. We give thanks, though we suffer. We give thanks for the good things, and yet remain to experience the lack of them. Thanksgiving seems a forced act, or at best, a constrained one. We think giving thanks is a pro forma kind of exercise — that it might even be pointless — and yet, the feast is ready, abundant, inviting. And still we come. We are there in person — we do partake of it. But where is the heart? And how does the soul absorb the abundance? Is there any delight? And can we enjoy what is offered, as guests at a banquet, when the banquet of our soul is barren? What do we bring to the feast? Or are we asked to bring anything at all? If giving thanks is reduced to a feast we prepare for one another, to the gifts we give, and food we eat, and the love we share, then it remains limited to what we have to offer — little or much as it might be. Though objectively good, this kind of giving thanks is but finite, and replaceable; conditional in most ways, and imperfect as well; ultimately unsatisfying, for we always desire more, even when receiving much. If giving thanks is elevated to becoming the action of gratitude, an action tied to justice — being grateful for the fact that what we ourselves have to offer is not ultimately ours, and has its origin in God — then it begins to be oriented differently. We are given a way to offer gratitude irrespective of our frailty. This is a gratitude rooted in a reality beyond our limitation, and beyond the incapacitating effects of our experiences. Here, in the recognition that God’s unmerited generosity comes before even the greatest lavishness of our lives, and the privations they are packaged in, we are made capable to see in our poverty, in our radical insufficiency and in the agony of this struggle, the first possibility of offering our very selves. We may have little, or so we think, until the experience of our poverty becomes so pervasive, and the awareness of it so acute, and its pain so unbearable, that we conclude we either have nothing, and so despair, or that we have everything we need, and that it was given us precisely to teach us the generosity, and the freedom, and the joy of offering it back. No place is this paradox of gratitude more apparent than in the context of forgiveness, or of the holy Sacrifice of the Mass. To be forgiven one’s wrongs is the gift of receiving gratuitously what is unmerited. We can never repay God for the mercy He lavishes, and can never fully right wrongs we inflict on each other. What we offer is always lacking, always imperfect. The Sacrifice of the Mass stands in contrast to this human limitation. We receive gratuitously what we have not merited: union with God, effected spiritually through grace, and physically, in the reception of His sacred Body and Blood. In this way the offering of the Mass is the prayer of eternal Thanksgiving. The offering, coming from God and perfected in Him, is returned to Him who is the beginning and the final end of all that is good and holy. If the traditional Thanksgiving feast means anything to us, it should be a visual reminder of precisely this reality. We go from the Gethsemane of our lives to the summit of thanksgiving that is the Eucharist (Greek: εὐχαριστία (eucharistia), meaning thanksgiving). We remain the same people; burdened with sin, with doubt, with uncertainty, with the envy and jealousy that indelibly mark our lives. We experience profoundly our own weakness, and the revulsion of the pain that suffering entails. We rebel, we are unfaithful, we live trapped in the impurities that allure and entice us to the shadows. But if the Gethsemane is the place of pain, the altar is the place of glory. Here, bringing our wounded nature and imperfect offering to the banquet feast, bringing what we perceive as little and unworthy of so lavish a Host, we receive infinitely more, and are so transformed time and time again. We are purified, and precisely in all this need, all this barrenness of soul, we are given to absorb that superabundance of gifts that a just God lavishes in love. Grace operates on our wounded nature, we believe perfecting it. This process is fraught with struggle, sometimes with fear and veiled hope, and yet from it we arise revived, strengthened. Does this make any sense in the context of modern cynicism, and the real, pervasive loneliness and frailty of the human condition? Can it actually be real? We look forward with the knowledge that the Incarnation happened so that our human nature, writhing in agony, might be elevated to the capacity for a share in the divinity of the One who assumed our humanity to redeem it. Life ebbed away in the Garden so that it could redeem the world. This was real. And yes, Gethsemane is likewise real. No one likes to be kneeling there while the world sleeps, as though the agony were inconsequential, or simply senseless. We can look to a Savior who asked that the cup pass before He ascended the cross. Human nature revolts at pain, at betrayal, at the agonies and pangs of heartbreak and squandered love. It is weakened by illness, and loss, and the pervasive experience of loneliness. It is challenged existentially by the experience of death and separation. It is frustrated in the barren toil of fruitless loves. It suffers the consequences of pride, and rebellion, and infidelity. The loneliness of the Garden is relived in modern cities and in monastery cells. No one is spared. Christ was not spared. And yet, we return time after time to the altar of sacrifice to receive in sacred Flesh what once was offered for us in all innocence and all love: a perfect sacrifice made eternal on Calvary is now an offering of perfect thanksgiving to make up for all we can not repay. And we are given the way, the one way to give thanks, in that ultimate union that we call a Holy Communion. Ultimately, this is a Eucharistic prayer, an offertory prayer. When the Incarnation encounters the cynicism of modernity, it unravels it. 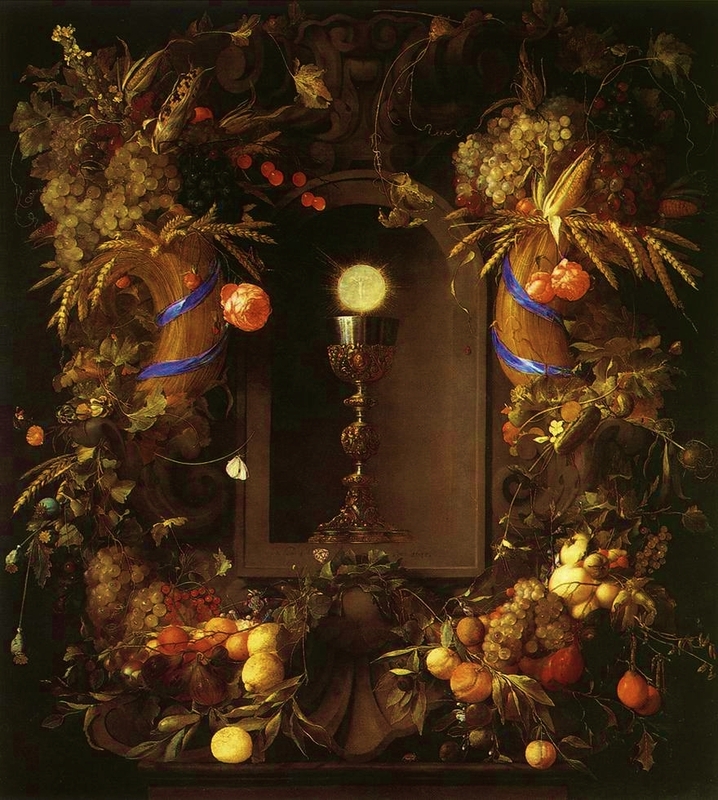 The table feast we join is none other than a symbol of the altar. And the altar is always a place of sacrifice — the place where the broken and the temporal and the passing, encounters the whole, and the eternal, and the enduring. Here our lives become the crowning offering for the feast, and here we no longer have excuses. It is, indeed, difficult to celebrate a festival of thanksgiving, when giving thanks is an act that must be summoned from the remnants of our broken lives, from our dying. It is, in fact, impossible. But we have more at our disposal. What kind of grace, we ask, is grace that pains so much? What kind of thanks, we ask, can we give God for this kind of piercing grace? In the oratory of the soul, it seems Gethsemane and gratitude go hand in hand. Like ‘Let this cup pass‘ and ‘Thy will be done‘. Like bread and wine. Creator and creature. Sin and grace. God and man. What shall I render to the Lord, for all his bounty to me? It seems our very selves is the answer — through Him, with Him, in Him — when nothing else make sense. It is a Sacrifice of Thanksgiving we are invited to. Through Him. With Him. In Him. The feast begins. And we behold a miracle.